There is not enough perceived value in digital content to sustain the revenue-streams publishers require to maintain their editorial quality. Publishers around the world are beginning to switch from a product-centric view of publishing to a value-centric one. This implies a fundamental change, switching from publishing a newspaper to focussing specifically on delivering value based on content, expertise, curation and trust in the brand. The trend towards mining available assets at a publisher to find new ways of engaging with customers is here to stay. Since the first part of this article was posted a few months ago, the mood around digital publishing has considerably darkened, and what I initially suggested as a personal view has since solidified to attain an aura of inexorable truth: the perceived value and the monetization prospects of digital content are constantly diminishing. While Facebook proudly boasts billions of daily content views, only very few participants in the production chain of the content in question seem to be able to make decent money from it. And things are not getting better in terms of advertising either. Roughly 80% of the money spent on digital advertising go to Google or Facebook. Bullish views on the value of social propagation of content are sadly reminiscent of the early days of the web: the common hope that “as long as you get the eyeballs, revenue just has to follow” has been proven wrong over and over again. “For dollars in print you get dimes on the web” the saying used to go, and “for dimes on the web you get pennies on mobile” is the sad second part to this statement. I concluded the first part of this essay with the words “The point I’m trying to make is quite simple really: instead of looking at the realm publishers function in as being predominantly digital, with print being at best a leftover from an increasingly anachronistic past, we should forget about the whole digital/analog divide for a moment and place publishing in the real world. Even if we have our hands full keeping up with the increasingly convoluted technology landscape, we should simply forget about the delivery aspects of what we produce, to focus on what the actual, real-world value is that we are trying to deliver to our customers.”. The operative words here are real-world value. It is becoming increasingly clear that in order to have proper monetization of professionally produced editorial content, the digital realm alone may not suffice in the long run, however starry-eyed some analysts are about the prospects of mobile advertising. Rest assured, in no way, shape or form am I trying to minimize the importance of digital content and social media distribution. But I also have looked a lot at what publishers around the world are doing — and it has made me realize that a secret revolution may be underway. How much perceived value does Facebook have for the average user? What about Google Maps? Or Snapchat, WhatsApp, Buzzfeed and thousands of other on-line services? Well? We have of course no way to be certain, but it seems rather likely that if any one of the most popular on-line services and platforms charged even a minimal amount for their use, only a small fraction of users would be willing to pay. Which in turn means that while users undeniably perceive the convenience of these services, they much more rarely seem to see actual value. Traditional media companies, on the other hand, always had to deliver value to their customers, since they usually charge for their wares. Perceived value and some form of excellence was always required in this field – after all, customers vote with their pocket-books, not with a simple click of the mouse. It all started with a simple necessity: given that distribution and ad-revenue of newspapers (and to a lesser extent magazines) are diminishing, publishers started to investigate alternate revenue streams, exploring new ways to make money. (WAN-IFRA has an excellent report on the subject). Events, in particular, turned out to be a very serious source of additional revenue for publishers as diverse as New Yorker, Le Monde, The Guardian and even digital pure-players such as Recode, to name but a few. What is rather remarkable about this trend — and what makes me think that the term revolution may not be too extreme — is that for the first time since the arrival of the web, a media trend is not directly defined by a technological evolution, but rather by aspects of life that lie squarely outside of the digital realm. In the words of Andy Hart, SVP and Chief Revenue Officer of Hearst: “We need to give experiences to readers that meet their human needs”. While Die Presse may be an outlier in terms of diversification, many publishers have realized that it has become essential to reach outside of the digital realm to connect with customers. Le Monde in France has not only stabilized print distribution, but it has managed to establish its weekly M Le Monde magazine section as one of the leading trend and lifestyle publications. Le Monde is betting squarely on fast-paced innovation to stay competitive, and has developed a wide range of events that contribute significantly to the revenue stream.. Turning brand and expertise into value-centers. The examples above actually only scratch the surface. 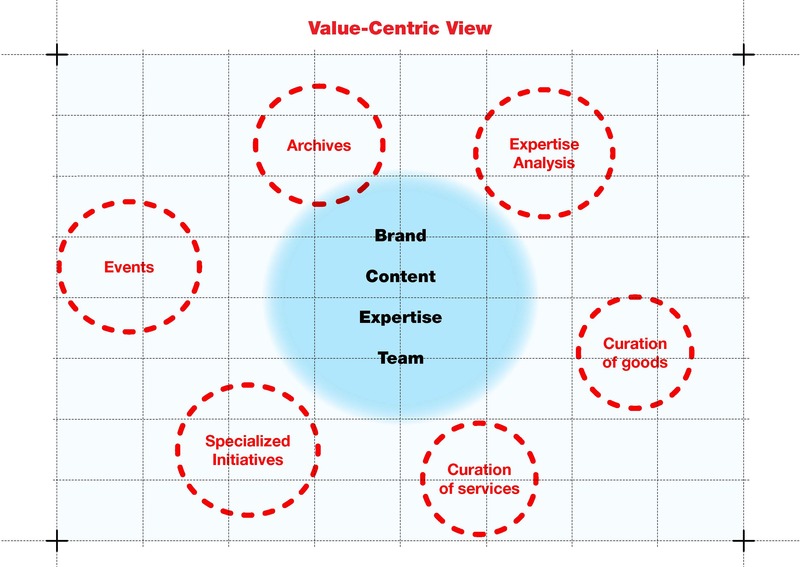 Based on a publisher’s key assets (Brand, Trust, Content, Expertise, Editorial Team) there’s a wide range of value-centric activities that can be developed. Below are some basic ideas. Any comments and suggestions are welcome! Magazines or books based on the available archives. Curated e-commerce sites and physical stores. Magazines or books that provide in-depth analysis on burning economic or political issues. Providing advice and assistance through available expertise. Provide information and events for highly motivated vertical markets such as gaming or cooking..